This sandwich is just a simple recipe. This is one of mine favorite sandwich which I usually prepare at tea-time or morning breakfast also. A fresh and delicious sandwich recipe. I remember my mom prepares this sandwich when we used to go for picnics. These sandwiches can also be made for children's school tiffin as well as wrapped and taken while traveling. 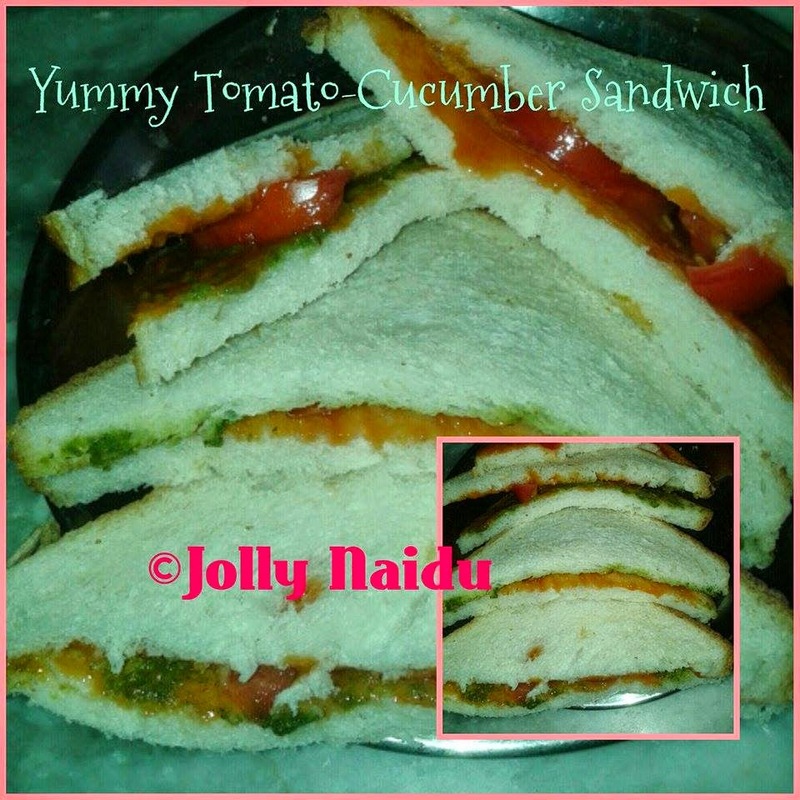 It is quick, simple and easy recipe of sandwich. Tip : You can use any bread like white bread, sandwich bread and brown bread. This recipe is going with all breads. 1. Buttery Dip : Take a pan, add 2 tbsp of tomato sauce and 2 tbsp of butter, melt the butter for few seconds on a low flame with sauce. Turn off the flame. 2. Apply the fine layer of buttery dip first. Then apply the green coriander chutney layer and do the same thing on second bread. 3. First arrange a layer of sliced cucumber, then a layer of tomato. Sprinkle little salt and pepper on veggies. 4. Gently press the top of sandwich and cut the sandwich to form two triangular pieces. 5. In the same way prepare rest of the sandwiches, serve it with tea or drinks. 1. You can use butter dip layer on one side of bread and use green chutney layer bread on other side. 2. You can use use buttery dip on both the sides of bread. Use the same method as above.